Fastest crowdfunding campaign ever has collected money for an athlete and rock band singer Vitaĺ Hurkoŭ. Online registration on the 6th International Congress of Belarusian Studies is now open. Svetlana Alexievich held its first public presentation in the very heart of Minsk – the Palace of Republic. A public campaign In Defense of Belarusian Swamps achieved the adoption of the Strategy of conservation and sustainable use of peatlands. IDEAby published a grid based on relations between Belarusian political parties and movements' leadership. This and more in the new edition of Civil Society Digest. Fastest crowdfunding campaign has collected money for an athlete. For 7 hours a crowdfunding platform Talakosht collected Br68.2 mils ($3,4K) for Vitaĺ Hurkoŭ to participate in the Muaythai World Championship in Sweden. Vitaĺ Hurkoŭ is a world champion and vocalist of BRUTTO band banned for performances in Belarus. After his dismissal from the Ministry of Vitaĺ Hurkoŭ looked for money via crowdfunding; his campaign was supported by 170 people, who donated from $2,5 to $250. Talaka.by celebrates one year of its crowdfunding activity. During the year, 19 out of 48 crowdfunding campaigns hosted at Talakosht (Talaka.by crowdfunding resource), finished successfully. More than 200 people consistently support the new campaigns at the platform. The total amount of funds raised is around Br600 million (around $30,000). To the 10th anniversary of the Kalinoŭski programme, opened since 2006 for repressed Belarusian students and funded by the Polish government, Svaboda.org has collected 10 alumni success stories. Andrej Dyńko, Naša Niva editor, reviewed the stories and revealed that 9 of the 11 best graduates remained in Poland, two of them opened the hookah. Dyńko concludes that now when there are no cases of expulsion from the Belarusian universities the program brings damage since the most talented youth move from Belarus. Online registration on the 6th International Congress of Belarusian Studies is open from 1 April. The 6th Congress will take place on October 7-9, in Kaunas, Lithuania. The Congress was initiated as an annual meeting of Belarusian and foreign scholars, experts, analysts and representatives of civil society and government institutions, which are involved in studying Belarus. Application deadline is 20 May. Swamp campaign won: the resolution on draining marshes replaced by strategy for their conservation. A public campaign In Defense of Belarusian Swamps started three years ago at the initiative of several people and has grown to the Bagna eco-CSO. The campaign could cancel the Council of Ministers' Resolution on peat extraction and achieved the adoption of the Strategy of conservation and sustainable use of peatlands. The organisers share their experience of successful implementation. Zrobіm! action attended by over 22 thousand people. On April 9, the global action of cleaning illegal dumps Let's Do It! (Zrobim! in Belarusian) gathered about 22,700 volunteers from 43 cities and villages of Belarus (1,500 volunteers last year). Participants collected 560,000 litres of waste, thus removing more than 500 contaminated sites. The action was coordinated by Green Network, Centre for Environmental Solutions, Interaction Fund, Minsk Cycling Society and government ministries. New educational program "City: Core, Community, Image of Action"is implemented by the Flying University in partnership with Green Network and Urban Tactics almanac. The course focuses on the modern approaches to the development of Belarusian cities and consists of three phases: intensive education, research and a summing-up workshop. Researchers and activists of environmental and urban movements are invited to participate. Deadline for applications is April 15. Svetlana Alexievich's presentation took place in the Palace of Republic. On April 14, a presentation of the Radio Svaboda's book Alexievich on Svaboda took place in the very heart of Minsk – the Palace of Republic. This was the first public presentation of Svetlana Alexievich in Belarus after receiving the Nobel Prize. One-fifth of appeals at the Comfortable City resolved positively. For five months of its activity the website Comfortable City (petitions.by) posted 137 petitions, received 58 responses from government bodies, and 26 issues were decided in favour of citizens. Two-thirds of appeals are linked to the community level. Appeals submitted via the website are legally valid and require a mandatory reaction of related officials. Freedom House has raised the rating of democracy in Belarus. In its annual report Nations in Transit 2016 Freedom House improves the Belarus' overall rating of the level of democracy, for the first time in six years. The growth is recorded only on two of the seven parameters – electoral process and civil society. 29 CSOs submit a group proposal for the changes in the rules of foreign aid receiving. The initiative to develop a consolidated position is initiated by Centre for Legal Transformation Lawtrend and the Assembly of NGOs. The program maximum is to cancel a permit procedure for receiving foreign grants and go to the notification principle, or at least to determine the minimum amount of aid, which does not require the state registration. Office for the Rights of Persons with Disabilities presents an annual monitoring of citizens' appeals. The total number of requests increased by 40% comparing to 2014. Geographical distribution is almost equal 49% (Minsk) and 51% (regions). The major part of requests is still on social protection issues – 39%. Increasing the number of appeals can be linked to the signing by Belarus of the Convention on the Rights of Disabled Persons, which took place in autumn 2015. Play "Seven" in Belarus. On April 4, in the framework of the UNFPA information campaign, the National Academic Janka Kupala Theatre hosted a play "Seven" aimed to draw public attention to the problem of domestic violence. The play is a monologue of seven women from different cultures, who have overcome major obstacles on the path to justice, freedom, and equality. In each country, the roles are performed by famous women and men. IDEAby map of the opposition. IDEAby published a grid of opposition relations, jokingly called ‘Who Hates Whom’. The grid is based on relations between Belarusian political parties and movements' leadership. It is noticeable that the relations within the opposition has changed for the year. April 26 this year marks the thirtieth anniversary of the Chernobyl nuclear explosion, when tests at the power plant there went calamitously wrong. Then in the Soviet Union and now in Ukraine, the consequences for Belarus have been disastrous. The accident occurred a generation ago, yet it continues to blight lives today. Future generations will find little respite. In the early hours of 26 April 1986, safety tests to the fourth reactor at the nuclear power plant adjacent to the city of Pripyat​ (population 43,000) caused a power surge. A steam explosion ensued leading to a fire, a further series of explosions and then nuclear meltdown. The core of the reactor was totally destroyed and the roof blown into the sky. Chillingly, survivors who watched from apartment balconies in Pripyat itself, just two kilometres away, reported that the deadly pall billowing from the roofless reactor actively glowed. Yet none of the onlookers had any idea of the mortal danger they were in from this spectacular pyrotechnical display. In the immediate aftermath the State responded by saying and doing very little. The concerns of the international community were met with silence and denial. Other than the commencement of evacuation from the immediate area, little was done in terms of measures to address the effects of radiation on the general public, who received no information about what had happened. The authorities had little idea of what they were dealing with. A massive clean-up campaign subsequently began, largely involving the sluicing-down of buildings and other structures. But the major consequence of this was to wash the radiation down into the ground, increasing the level of contamination. Land covering approximately 20% of the territory of Belarus (most of it in the south-east) continues to be affected by radioactive fallout. Thirty years on, accessing reliable information as to the impact of this in terms of hard statistics continues to offer something of a challenge. Statistics can always be selectively presented to ‘prove’ a particular point, and perhaps it comes as no surprise that conclusions in high profile reports published by the energy and green lobbies differ extravagantly. One side of the debate claims that only 28 people died from acute radiation exposure. The opposite side attributes thousands of deaths to the explosion, with many thousands more apparently identified as suffering from carcinoma and related conditions. Visits to ‘hot spot’ areas where rain dumped larger doses of radioactivity are only permitted with the prior approval of the authorities, and then only when accompanied by officials. Here, signage displaying the international warning logo is everywhere to be seen, though the extent to which the authorities continue to control access is subject to question. Whole villages stand abandoned to the elements. Once a year the bereaved are permitted to visit cemeteries to honour the dead, on the occasion of Radaunica (Ancestors Remembrance Day), a public holiday that falls on the ninth day after Orthodox Easter. Over time, a number of people (particularly the elderly) have returned to homes that are still capable of habitation. No reliable studies exist as to numbers or the extent to which risk to health remains. Some issues are beyond ambiguity, not least the stark reality of fallout 400 times greater than generated by the bomb detonated over Hiroshima in 1945, and 16 million times greater than the accidental release at Three Mile Island in Pennsylvania in 1978. Around 135,000 people were forcibly moved from the immediate area. The town of Pripyat itself stands as an abandoned wasteland, crumbling, frozen in time and left to the mercies of the elements. Wildlife rules events here. As the scale of the catastrophe began to emerge, the circle of evacuation widened. The State moved many hundreds of thousands more from their homes in towns and villages further afield (including my own adoptive family living 236 kilometres away in Vetka). Between 300,000 and 600,000 people were engaged in the decontamination of the 30-kilometre exclusion zone around the plant (known as ‘liquidators’). In the years that followed the explosion, instances of thyroid cancer rose dramatically amongst those living in the area or under the path of the radiation cloud, particularly children and teenagers. Over 500,000 people in Belarus alone present thyroid problems to this day resulting from absorption of radioactive iodine into the thyroid gland. In my own circle of acquaintance in Belarus, I personally know more than a dozen people so affected. Yet swiftly administered doses of non-radioactive iodine on the part of the authorities would have significantly reduced the absorption of this radioactive isotope. Today, almost two million people continue to inhabit areas within Belarus that remain subject to radioactive contamination, largely from caesium-137. When this and other noxious elements fell on the ground and into the watercourses they entered the food chain, perpetuated still by the circle of life. Caesium-137 has a half-life of 30 years. So on this thirtieth anniversary of the disaster, the concentration of contamination from this isotope has reduced by just 50%. It will be another 30 years and another generation before it halves again. Outside the Church of St Simeon and St Helena in Minsk (the iconic ‘Red Church’) stands the poignant Nagasaki Memorial Bell erected in September 2000, a powerful symbol uniting two communities ravaged by the elemental power of nuclear energy gone wrong. On the day of the anniversary itself I shall be in Vetka for the annual service at the memorial stone and adjacent church bell, deliberately and symbolically cracked when cast, fatally flawed forever. The pain remains visceral, though acts of remembrance extend beyond commemoration of loss into areas of practicality. 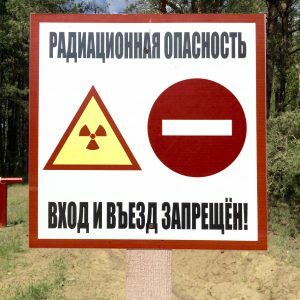 In the whole of Belarus, Homiel region suffered the worst contamination of all. To assist with the mitigation of the explosion’s consequences, the State established the Paliessie Radiation and Ecology Reserve in the region to study the effects of exposure to radioactive material and to develop long-term contingency planning. As for the stricken reactor itself, the concrete sarcophagus erected in 1986 has exhibited cracks for many years, in all probability causing more radioactive material to leach into the surrounding ground and the waters of the River Prypiać, one of the largest expanses of free-flowing water in this part of Europe. The international community has come together to design a more sophisticated tomb on a massive scale, this time made of steel. Still under construction adjacent to the reactor, the new arch will be painstakingly wheeled into place some time in 2017 and the ends sealed. Until Japan’s own nuclear disaster at Fukushima in 2011, the environment affected by Chernobyl was like no other on earth, affording a unique opportunity to study one of the most significant issues facing the future of the planet. The fact that Fukushima happened at all suggests that by 2011, the lessons of Chernobyl had still not been heeded. Even today, questions about nuclear safety continue to arise. The government of Belarus has commissioned a new power plant close to the border with the European Union, just 50 kilometres from Vilnius. ‘Unsafe,’ cries Lithuania. Belarusian submissions of observance of the strictest international standards are met with counter-allegations that international requirements are not being met. While the debate rages, Chernobyl radioactive isotopes with half-lives of tens of years remain present in the land and waters of Belarus, and symbolically within the national psyche of its people. Thirty years have now passed and the insidious consequences of the calamity show little sign of abating. In 2016, there remains significant ‘fallout’ still.